Alan “Bak Fu” Vasquez Sifu and Lawrence “Shi Kuen” Ramirez at Orange County Wing Chun Association, in Lake Forest, California. The path I took in developing my Kung Fu was indeed a long path. I was a product of the permissive society of the seventies, and found great delight in evening TV shows with the family. As the TV dramas unfolded, my friends and I as children acted out our favorite shows as was our duty. It also might have been due to the fact that cell phones, internet and video games would not be invented for another few decades. At any rate one of our earliest of heroes in the streets had to be of course James Tiberius Kirk from Star Trek.Because of all his fight scenes he was the obvious first choice, and it was a great honor to get the role of Kirk among your friends. But like the saying goes change is inevitable. Summers pass and heroes fade, well some heroes fade. In the same year there was another series airing which starred a relatively unknown Actor martial artist from Hong Kong by the name of Lee Jun Fan, or to you and me Sigung Bruce Lee. Enter, “the Dragon”- influence- that is. Martial Arts had come out of the shadows and were on the Big Screen with Sigung Lee Jun Fan shining bright in the spotlight. And if that were not enough we could always get the reruns of Green Hornet airing. Martial Arts had broken out of the shadows and Dojos were popping up in every City in the US. Now that was good and feeding my interest, but it wasnt until February 22, 1972 then again in August of 1973 that I sipped of the cup from which I would forevermore thirst. In February of 1972, ABC released a Movie of the Week Miniseries called “Kung Fu” that starred David and Keith Carridine as “Kwai Chang Caine” a Shaolin Monk traveling through the untamed West searching for his half-brother Daniel Caine. This for me was a game changer. Kung Fu, the fluid movement and powerful attacks Caine threw at those cowboys were amazing! I couldn’t miss an episode. Then in less than a year three powerful events struck and shook the martial arts world to its core. In December of 1972 Bruce Lee lost his Sifu (martial arts teacher), Grandmaster Yip Man, a Master of Wing Chun Kung Fu. At this time in American only a few people had known of this tragic loss and how it had to of no doubt troubled Lee Jun Fan deeply. At this same time he was in Hong Kong filming a movie that would skyrocket him to fame, but this film would be released six days after the Star of Film and Master of the Martial Arts would die. Lee Jun Fan, aka Bruce Lee died on July 20th 1973, his Hallmark Epic film Enter The Dragon was released in Hong Kong on July 26th 1973. Chinese Martial Arts had gripped American Cinema, and the imaginations of millions within a year of Lee’s passing, and it would build and grow exponentially, by previously unseen proportions. The American theaters didn’t get the film till one year after its release but those in the know, had seen it and were already spreading the word of its supreme Martial Arts action and its “Extraordinary” lead actor. Within this world of cinematic martial action it was hard not to follow its enticing lead. In almost every city around the US Chinese Martial Arts Schools or Kwoons started opening, and the Master, Sifus already here in the United State started sharing the Way, America and I were following. For most Middle, High school aged kids of Native American, Latino, also people of African and Chinese descent growing up in Orange County provided challenges. Racism still existed. The fact that Bruce Lee changed his name as he tried to break in to Hollywood, solidified this. But this great film started something wonderful, it took down a barrier that shadowed Chinese Martial Arts and its culture for many years. Karate, Judo and Taekwondo held its place here in the States for nearly a decade but as Enter The Dragon made its Big Screen debut, this “closed-door” had been blown off its proverbial hinges. It was during this same period in time that my Sigung Robert ‘Yeung Biu” Yeung, after getting blessings from Ip Man to teach and open a kwoon moved to Honolulu, Hawaii to do just that. He established the Hawaii Wing Chun Kung Fu Association in 1972. Robert ‘Yeung Biu” Yeung had been taugh specificly from Master Wong Long Ching and Late Masters, Wong Shun Leung, and Wong Tsok. During the years that follow there were changes in location and growth of the Wing Chun Association in Hawaii. Notable Sifu’s from this kwoon are too numerous to mention but listed here are, Bob Tome, Bobby Cheng, Donald Li, George Asato, Richard Wong, Lawrence Miyashiro, Rodney Lam, Art Kodani, John Divirgillio, Jame Sweet, Randy Sanches, James Tanaka, Wayde Ching, Marco Rivera, Embrey Williams, Thomas Perry, Gary Yokoyama, Mike Koenig, Ed Dumancas, and one other notable Sifu, Alan “Bak Fu” Vasquez. My Sifu, Alan “Bak Fu” Vasquez, Captain US Army (Retired), Branched Infantry, and Military Intelligence; Viet Nam Combat Veteran, with Recon Ranger, and Special Forces duty, started studies with Yeung Biu’s Hawaii Wing Chun Association in 1977. After serving his country and being injured in paratroop exercise that would ended his military career and almost took his life, “Bak Fu Sifu” Started teaching Wing Chun Kung Fu in 1979. The Orange County Wing Chun Association was founded in 1979 and is still located in Lake Forest, Orange County, California. I myself had met Sifu Bak Fu in 1994, 95 during a time where our daughters attended the same grade school. I had no idea this meeting “Bak Fu” was such an auspicious occasion, and again a game changer for me. At the time I had grand design to move to Hawaii and take a break from the hustle and, well mostly hustle of Orange County life. Keeping up with the OC is taxing to your mental health and pocketbook. To make it you need to be on a freeway at 5am to make it to a destination five miles away at 7am. I still have family and friends that make the daily pilgrimage, and I still feel for them. And I did just that in 1995 I moved to Kailua Kona, Hawaii where I took up concrete construction as a trade, and surfed and read Buddhist Text as a hobby. Growing two young girls is a hard job for a family let alone a single man so after several years of living Island style I packed it up and moved back to the OC. It was a change of local for my family, but little did I know how much that move would change me. It was early September 2001 and I had just finished a move for my family that included two trips back to Hawaii. I had my daughters renrolled at the same school they attended some five years before and I was lying on the living room couch watching the news when it happened. 9/11/2001 US Attacked. I was in disbelief, total denial. I count fathom what was happening before my eyes, I watched the news for the next hour changing every channel making calls and worrying about my girls at school. Well after it was established that the East Coast was targeted and the rest of America was spared the terror of warfare, I picked up my children from school and continued on with life as we all did. It was during these seemingly mundane days after I returned to Orange County that Bak Fu’s daughter Lisa had again struck up friendship with my girls at school, and days of pool party PTA meetings and sleepovers ensued with Alan picking up all the girls and taking them to his house or I picking them up and them dropping off, but there was another element that was inherent in these days of fun and childhood play. Sifu Bak Fu held Wing Chun Kung Fu class daily at his home kwoon, so the girls would not only get pooltime playtime, but also kid class Kung Fu time. I Alan suggest I come a to a session when I can and after a time I took in his offer and showed up to a session. My Daughters and I attended Orange County Wing Chun Association for the next 6 years as time allowed and we all progressed through the ranks. As we changed and grew in spirit and as our Kung Fu was cultivated and manifested within. I am proud of my daughters Iliana, Rachel Ramirez, and Lisa Vasquez. They are all responsible adults attending college in California and Hawaii. At current Rachel Ramirez holds a Blue Shirt Advanced Student position, Iliana and Lisa are both Black Shirt Certified Instructor of Wing Chun Kung Fu. At present Pacific Wing Chun Association has classes in Kailua Kona, and Waikoloa on the Big Island weekly, holds seminars and has welcomed several guest Sifu and Master Martial Artists from Around the World. Some honorific guests include: Sifu John Di Virgillio of Hawaii Wing Chun Association, Alan “Bak Fu” Vasquez Sifu of Orange County Wing Chun Association, Screenwriter of Forbidden Kingdom, Actor, Martial Artist, John Fusco. Master Kung Fu, Martial Artist Lucky Shaffer. Greco Wong Wing Chun Association Member Scott Cannam, and Cameron Ameri association member of Wing Chun Kali Systems of Houston Texas. The list keeps growing as does our Association. 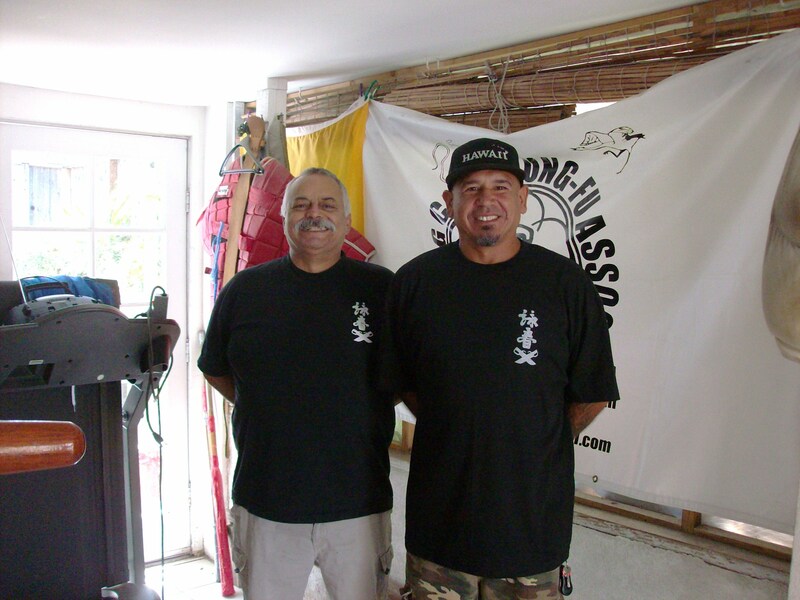 ← PACIFIC WING CHUN KUNG FU ASSOCIATION Welcomes Scott Cannam back to Kailua Kona, Hawaii. You make an old man very proud!!! I am honored to have had such a great teacher and mentor in my life Sifu. I am proud to belong to our family as a Sifu passing on what you have taught me. Respect being absolute. Mahalo Nui Loa.